“Famous Nathan” taps into the tradition of the intellectualized, “personal” documentary. 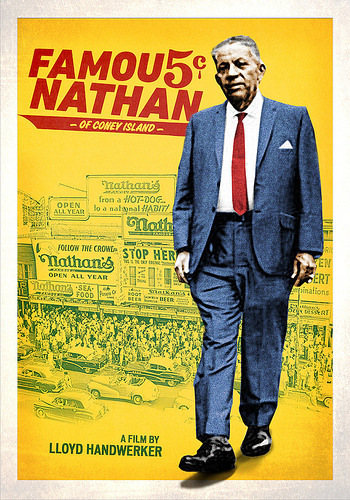 Ostensibly, it’s about the Nathan’s franchise of frankfurter establishments, but it’s really a sort of essay on the topics of family, New York Jewry, Coney Island, the immigrant experience, and the corporatization of America. The maker of the film, Lloyd Handwerker (the grandson of Nathan’s founder Nathan Handwerker), seems to have worked on it over a period of around 30 years, and that long gestation is reflected in the picture’s form: it’s layered, heterogenous, and lullingly recursive, as though it’s been repeatedly gone over and recomposed, first in the mind, and then on film. (Like the best essay films, it often succeeds in evoking quicksilver mental processes.) Handwerker may have taken the “Godfather” pictures as a model: His themes and Coppola’s are similar, and the way in which he cuts between the old man’s rise and triumph, and the gradual dissolution of the business under his two sons, generates a pathos reminiscent of the second entry in the mob series. Some parts drag a little — Handwerker isn’t afraid to pursue a tangent when he finds it interesting or amusing. But even during the slow bits it’s enjoyable as a document of a vanished world. This entry was posted in Food and health, Movies and tagged Famous Nathan, Film, hotdogs, Lloyd Handwerker, movies, Nathan Handwerker. Bookmark the permalink. Sounds good. As good as a Nathan’s frank? I liked Deli Man, which sounds similar. But not as much as a Katz’s pastrami.